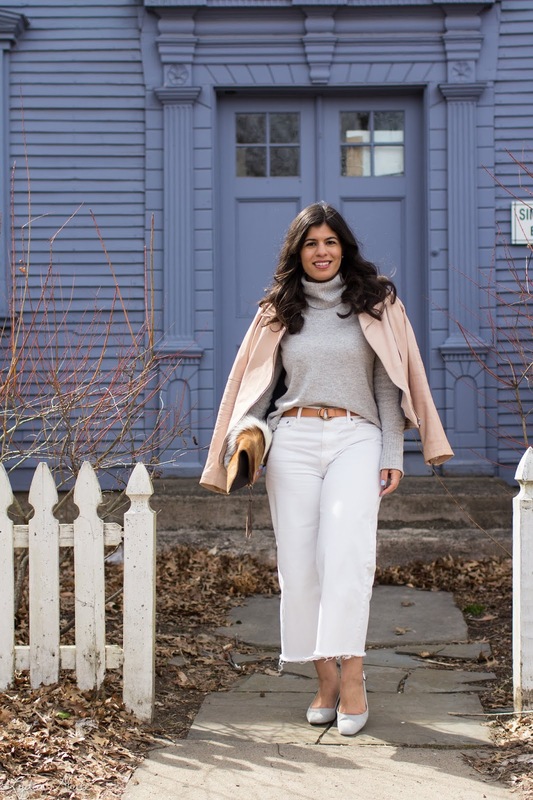 Yesterday I attended a blogger event in Rocky Hill, Connecticut, and since it was only ten minutes from this cute spot in Old Weathersfield, I met Meg early so we could take outfit photos. 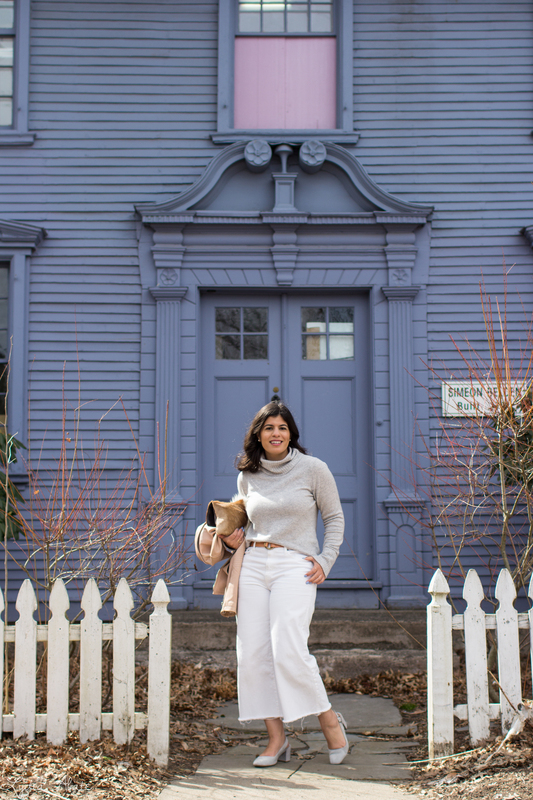 I really love the old homes in Connecticut, even though a good many have been transformed into businesses, as long as they are preserved I'm happy, and then I feel far less uncomfortable taking photos in front of them. (On the rarest of occasions I've taken photos in front of a single family residence I've come to regret it.) You can't read the year on the plaque in any of these photos, but this home was built in 1767, and I really admire the care and detail that went into it. Despite having a frigid and windy Saturday, driving away from the shoreline on Sunday gave way to a far more spring-like day. I always struggle with what to wear during transitional weather, will I be too warm or too cold? Should I dare to wear a dress, or resume the safety of jeans and a sweater? Bare ankles and a cozy sweater felt like the safest bet, but it's looking like April will be more welcoming to bare legs and maybe even bare toes if I put that much stock in the ten day forecast! Even though it wasnt a dress this still felt like a nice transitional spring look! Very nice ensemble! Great sweater! This spring outfit is so chic. I love your jacket!! 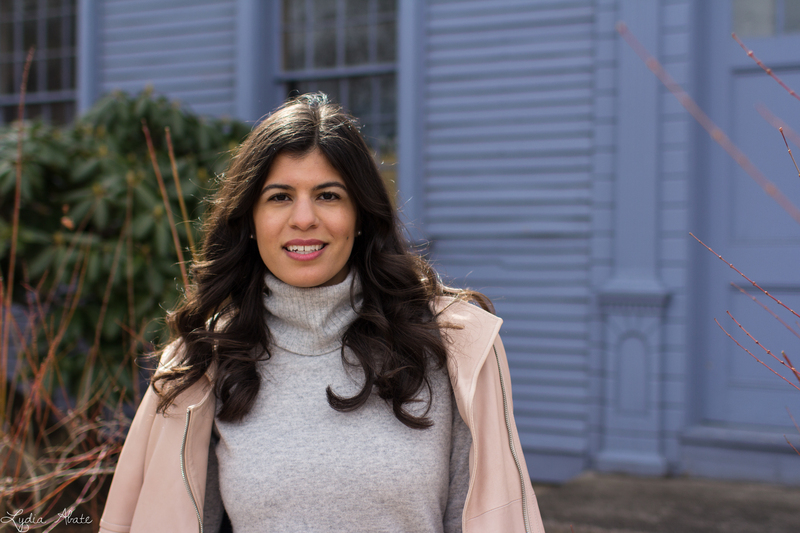 I miss all the beautiful historic houses in Connecticut so so much - this one is a beauty and a perfect back drop for photos! SUCH a gorgeous building, I can see why you chose that for your outfit shoot spot! 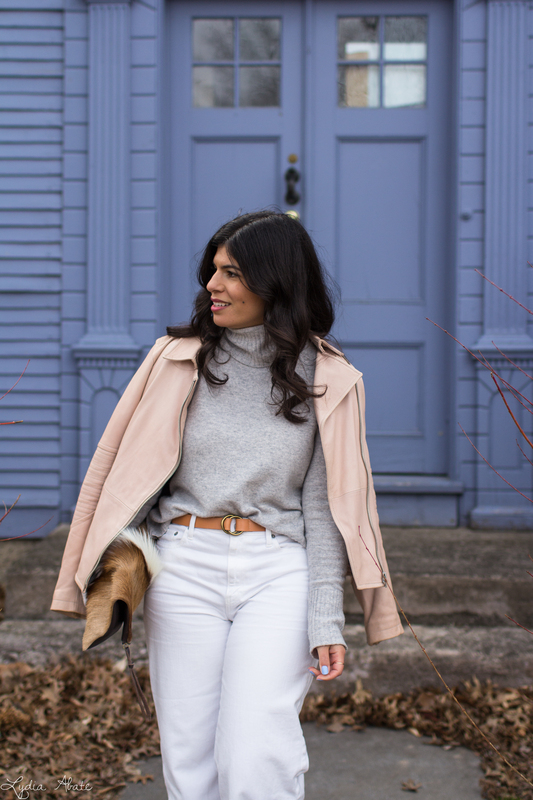 Such a great spot for outfit photos, and I am loving the blush and grey in your outfit. With the white pants it looks so spring-like! I know you're waiting for it to warm up, but I'm looking forward to it cooling down, haha! Just like our hot summer, it's becoming a very hot autumn! I know that conundrum, totally Lydia!! This weekend I had bare ankles, yet 3 layers on top, just to make sure!!! This look is so chic! I love the denim!! The denim is so perfect! I dig the hem so much, this is so chic. I am loving this look! 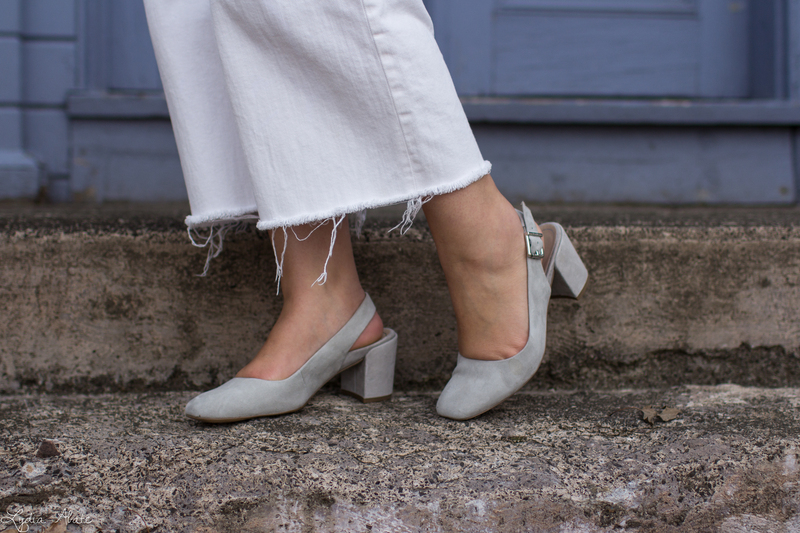 The hem and the heels really make me want summer to arrive. Dressing for transitional weather is more or less impossible to get right all the time, as far as I can tell. The weather changes so quickly and it's not like you can bring a change of clothes or shoes everywhere you go. I mean, you could, but that would be crazy. I wore a lighter coat on Saturday and froze in the morning, but by afternoon found it almost too hot. It's really a time of year when you can't win, but at least you can look cute. 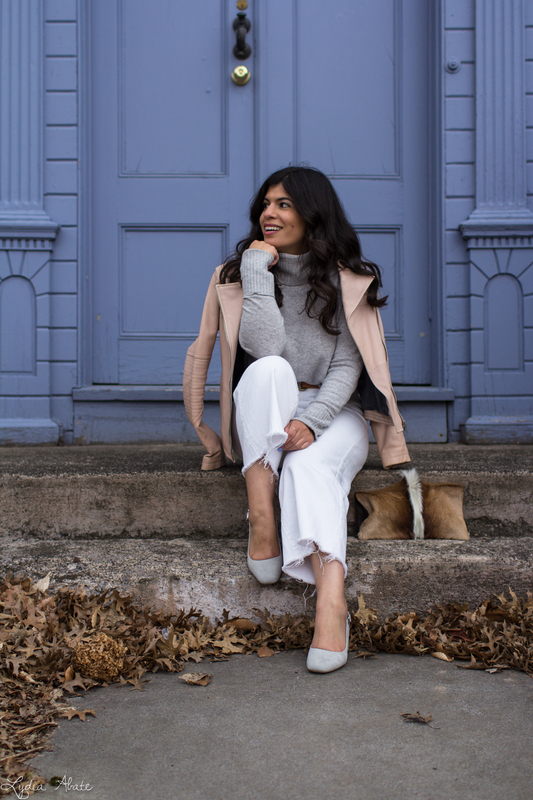 I love this combination of grey sweater and white jeans. I love the gray sweater with white jeans. 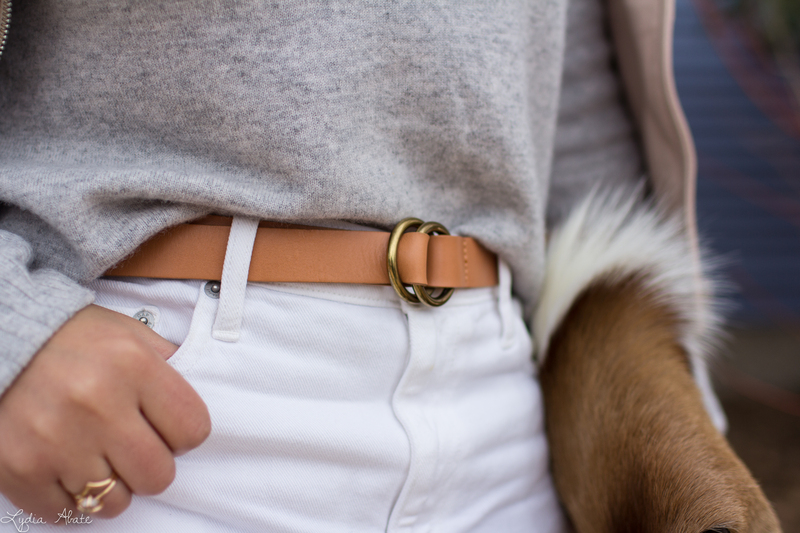 Your outfit is a classic with a trendy twist! I love the cropped jeans and the shoes but that sweater is just a cozy classic! I actually think this is the perfect look for transitional weather. Your top is very winter while your bottoms are very spring. Stunning! 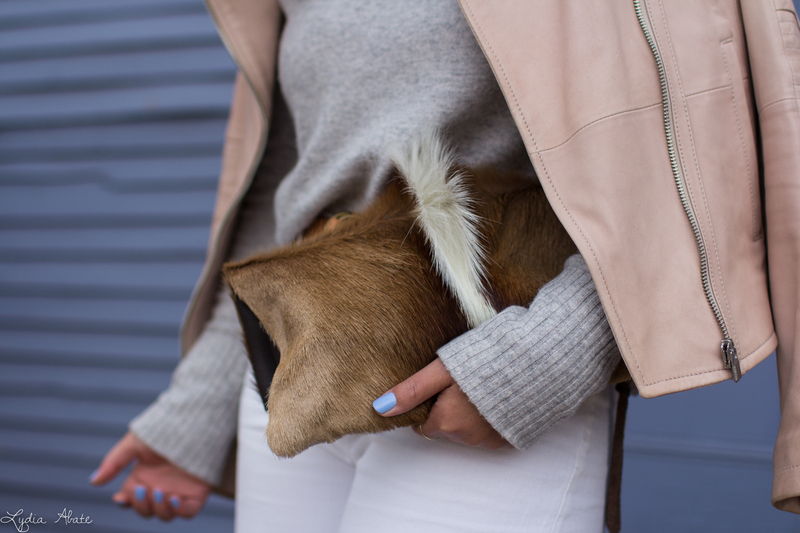 love this neutral look, it looks so luxe. Your clutch is amazing! So unique. Love the transitional outfit! That clutch is just amazing! I love historic homes. There are a few around here, but nothing that old! I love seeing historic places preserved! You look so gorgeous! I love your sweater!! What a beautiful scenario! The outfit is really cute. I love the colors that you picked! What a beautiful outfit. The sweater and the shoes are my favorite! This outfit is so chic. I love the colors. Best back drop ever - OMG I LOVE IT L! and your outfit is right on, the grey and beige together are so lux. This time of the year is always so confusing with what to wear! I'm from Georgia so we can get away with a lot here and when I lived in Boston I was super confused! !